Your new Chesney’s stove, electric stove, gas fire or electric fire product is provided with a One Year Warranty. Some products carry an extended warranty of up to 5 years and details of this are shown in your Instruction Manual or available from your Chesney’s stockist. In the event of a warranty claim please contact your original Chesney’s supplier. The warranty will exclude all naturally wearing components which are referred to as ‘consumables’. These consumables are items such as rope seals, glass, fire bricks and other insulated parts made from Vermiculite, grates made from steel, vermiculite or cast iron, log retainers, baffles made from steel or vermiculite, ceramic fuel effects such as coals or logs, thermocouples and oxypilots. Incorrect usage and/or the use of unauthorised fuels will invalidate the warranty. The warranty is only valid if the appliance has been installed by a registered competent person, compliantly and in full accordance with our instructions and has been registered with us either via our website or the Warranty Registration Card provided. Further to this, the warranty is subject to the appliance being serviced within 12 months of installation by a registered qualified engineer. In the case of extended warranty products the above will also apply and in addition to this is subject to completion of annual services thereafter and the replacement of serviceable consumables as necessary. This warranty covers manufacturing defects only for a period of 12 months from date of purchase. If the appliance has been installed by a registered competent person, compliantly and in full accordance with our instructions and has been registered with us either via our website or the card provided the standard warranty is automatically extended to 24 months. Chesney's employees and agents are not authorised to make any representations concerning the appliance unless confirmed by us in writing. Any advice or recommendation given by us or our employees, Stockist's or agents to the purchaser, which is followed or acted upon by the purchaser, but which is not confirmed in writing by us is followed or acted upon entirely at the purchaser's own risk. The purchaser is responsible for inspecting the goods upon delivery, signing the delivery note is acceptance of delivery in good condition. No claims for damaged goods shall be accepted unless we are notified in writing within 48 hours of receipt of the goods. No claims for shortages or incorrectly dispatched goods shall be made unless we are notified in writing within 48 hours of receipt of the goods. In the absence of such notification the purchaser shall be deemed to have accepted the goods. If the goods are found to be faulty on delivery the purchaser must notify us within 48 hours of delivery, we will then issue instructions on how to return the goods to us. If the goods are to be returned or collected they must be returned in their original packaging complete with all accessories and documentation. We shall not be liable for any loss or damage occasioned by the purchaser's failure to follow the directions as to re-delivery of the Goods. Once we have verified the fault, we will provide a replacement or full refund at our sole discretion. We test all returned items, and if a returned item is found not to be faulty by us or our appointed technicians we reserve the right not to provide a refund but to return the goods to the purchaser and to make a charge for the reasonable costs of all carriage involved. Any installation instructions provided by us are provided by way of guidance only to the purchaser and the correct method of installation will vary according to the environmental factors present on each installation. The purchaser should in no circumstances undertake installation of the goods unless it, or its agent or employee, is suitably qualified and sufficiently expert in such installation to understand how to follow the instructions correctly and install the goods safely in accordance with local building regulations. The warranty covers the exchange, at no charge, of the defective part. We will not be liable for any labour, shipping charges or other expenses of removing, inspecting or returning any part, accessory or stove. We will also not accept liability of installing or inspecting any replacement part or stove supplied under this warranty. This warranty shall not apply, and we shall have no obligations hereunder with respect to any stove, part, trim or accessory which has been subject to accident, abuse, alteration, misuse or neglect, or which has not been installed, inspected, operated and maintained in accordance with the printed instructions or which has been used with incorrect fuels. This warranty shall also be deemed as void if any repairs or modifications have been made to the appliance by any other party without the written consent from Chesney's. This warranty does not cover damage resulting from over firing the appliance. The outer coating is limited to a 12 month warranty and does not form part of the extended warranty. The glass is limited to a 12 month warranty against manufacturing defects and does not form part of the extended warranty. The following parts of your stove are considered consumable and are subject to wear, these parts will need to be replaced over a period of time and are not covered by this warranty and do not form part of the extended warranty. Insulated parts made from Vermiculite, baffles, steel or vermiculite, grates, static and riddling, rope seals, glass and door. The following are moving parts, these will need to be replaced over a period of time. These parts are covered by a 5 year warranty against manufacturing defects only, wear and tear will not be considered a defect and parts will not be replaced under this warranty. Door mechanisms, air plates, air control rods, door hinges and riddling rods. Chesney's manufactured stoves are all independently tested and approved and all carry the CE mark. The installation and operation of the appliance is clearly beyond our control therefore we can not accept any liability for the installation or operation of the appliance. As an authorised Chesney's Stockist we expect a site visit from you to asses if any claim constitutes a manufacturing defect, please contact the Trade Office to inform us that a fault has been reported and that a representative of your company will be attending site to inspect the fault. 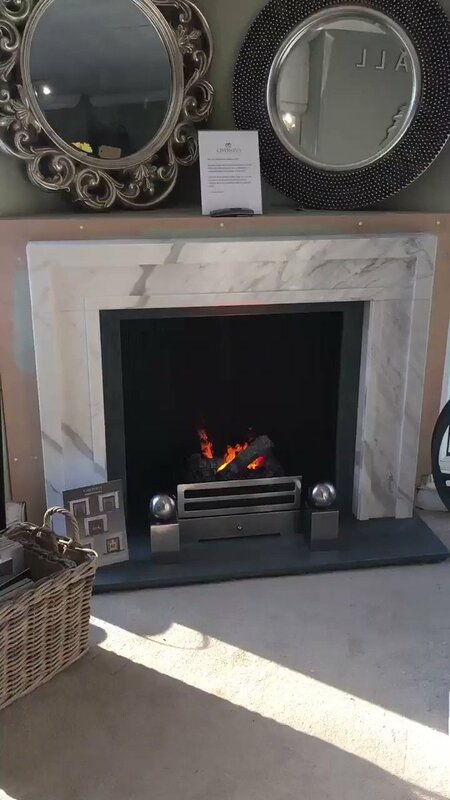 If it is a manufacturing defect you are required to inform us by completing a warranty claim form along with clear photo's of the defective part, We will then asses the claim and either send a replacement part or if required a replacement stove free of charge, all replacement items will initially be invoiced, a credit note will be issued on return of the items to us. When the replacement stove or part is inspected at Chesney's if it is found not to be a manufacturing defect a charge for the repair and carriage will be levied. This warranty shall not apply, and we shall have no obligations hereunder with respect to any stove, part, trim or accessory which has been subject to accident, abuse, alteration, misuse or neglect, or which has not been installed, inspected, operated and maintained in accordance with the printed instructions or which has been used with incorrect fuels, or if any repairs or modifications have been made by any other party without the written consent from Chesney's. If our own Engineer has to visit site and the fault is found not to be a manufacturing defect or it is found that a non compliant installation has taken place a charge will be levied against the Stockist including a mileage charge at the current HMRC rate from our London warehouse SW12 0PS. A charge of £25.00 will be raised if a non compliant notice has to be issued.